Thank you to everyone at Selinsgrove FFA for presenting me with this honorary degree! 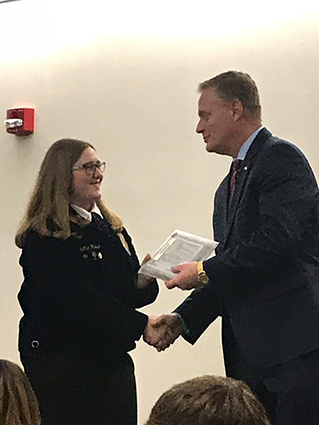 FFA is an outstanding organization that provides our young people with so many valuable leadership skills that will help make them successful in the workplace and in our communities. Earlier this week, the Commonwealth Financing Authority (CFA) awarded two grants totaling more than $750,000 in the 85th District. Through the Multimodal Transportation Fund, Hartleton Borough in Union County will receive $251,000 that will be used to resurface Shirk Road from Laurel Road to the borough line, a distance of approximately half a mile. The project will help alleviate poor roadway conditions and improve access and circulation in the borough. It’s always a pleasure to welcome a new business to our community! Oma’s Antique Emporium celebrated its grand opening and ribbon cutting on Saturday, March 16. Located at 315 Chestnut St. in Mifflinburg, owners Janet and Tom Diffenbach say the store will be open from 10 a.m. to 4 p.m. on Saturdays and Sundays. 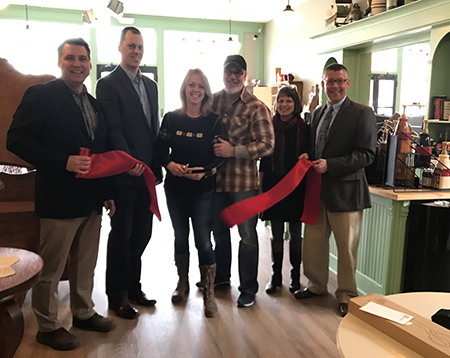 Pictured from left: Jeff Reber, Ben Ranck from my office, store owners Janet and Tom Diffenbach, Mifflinburg Heritage and Revitalization Association board member Judy Muchler, and Mifflinburg Mayor David Cooney. Pennsylvania Farm Bureau members from across the state gathered at the Capitol Wednesday to discuss their legislative priorities. 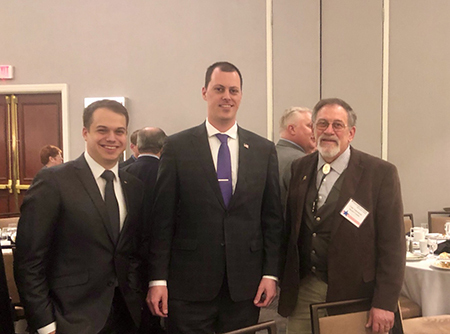 Pictured from left are Tony Rice, a student of Penn State’s Schreyer Honors College and officer in the Collegiate Farm Bureau; Ben Ranck from my office; and Clair Esbenshade, Farm Bureau State Board Director. PennDOT is advising motorists traveling in Union County that a bicycle race may impact travel in Kelly and White Deer townships tomorrow, March 30, from 8 a.m. until 4 p.m..
1003 (Fort Titzell Road) in Kelly Township and Routes 1008 (New Columbia Road), 1003 (Dyer Road), 1010 (White Deer Pike) and 1005 (Treibley Road) in White Deer Township, as well Millers Bottom and Gray Hill roads. Residents along the race course were to be notified by race organizers, the Bucknell Cycling Team. Motorists should be on the lookout for pedestrians and bicyclists in the area and are reminded of Pennsylvania’s Bicycle Law: When passing, you must allow at least 4 feet between your vehicle and a bicycle for the vehicle to safely pass the bicycle. When safe to do so, it is legal to cross the center double yellow line if necessary to provide the required four feet when passing a bicycle. Working to ensure Pennsylvania students have a diverse array of career paths from which to choose, the state House overwhelmingly approved a bipartisan package of bills designed to boost career and technical education (CTE) at schools across the Commonwealth. The initiatives are a cornerstone of the House Republican Caucus’ #GoodJobs4PA initiative aimed at ensuring all Pennsylvanians have access to good-paying jobs and careers. To help students plot their path to success, there are bills that would allow technical schools to recruit students like colleges do; make it easier for students to see where credits transfer; create a database of workforce development programs at secondary and post-secondary institutions; create an online career resource center; and allow students who complete classes in STEM education to apply the credits to a course through a vocational-technical school, technical institution or vocational school. The package is also aimed at improving business and education partnerships by creating a CTE investment incentive program, requiring CTE programs to establish advisory committees and having at least once administrator from a CTE center on each of the state’s Workforce Development Boards. The bills now go to the Senate for consideration. Learn more about #GoodJobs4PA here. The House last week gave overwhelming approval to a bill that would ensure public officials or employees who commit felony crimes related to their jobs will not collect a taxpayer-funded pension. Senate Bill 113 would expand the types of convictions that require officials or employees to forfeit their pensions to include any felony conviction, guilty plea or no contest plea related to an official’s job. 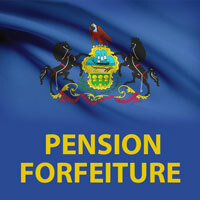 The measure would also put a stop to the practice of a person pleading guilty to lesser crimes to avoid losing his or her pension and closes several other loopholes that have been exploited by officials to continue to collect pensions from the state after breaking the law and violating the public trust. The bill is now awaiting the governor’s signature. Time to Dig Out the Rod and Reel! Spring has arrived and fishing season is not far behind! The statewide opening day of trout season is coming up on Saturday, April 13, but if you want to head south or east of us, the regional opening day of trout season is THIS SATURDAY, March 30. Click here for more information about counties included in the regional trout opening day. Of course, before you can fish anywhere, be sure to purchase your fishing license. They are available at more than 700 issuing agents across the state and at county treasurers’ offices. The price of a resident fishing license this year is $22.90. The most popular add-ons, a trout-salmon stamp and a Lake Erie permit, cost $9.90 each, or $15.90 for a combination permit. New this year are several voluntary permits anglers can purchase to provide financial support to specific programs or projects. The voluntary permits include: bass ($11.90); musky ($11.90); habitat/waterways conservation permit ($11.90); and wild trout and enhanced waters permit ($26.90). The prices listed are for annual permits; however, the voluntary permits may also be purchased for a period of three years, five years or 10 years. Click here for details about how funds generated by the sale of the permits will be used. For more information about fishing in PA, visit www.fishandboat.com. Volunteers are being sought for this year’s Great American Cleanup of Pennsylvania, which began March 1 and runs through May 31. A comprehensive webpage that includes all volunteer opportunities available, from the Great American Cleanup of PA and Adopt-A-Highway to Safety Training, Litter Brigades and more, is available here. The cleanup is sponsored each year by PennDOT, the Department of Environmental Protection (DEP), Keep Pennsylvania Beautiful and other partners. During last year’s cleanup, 108,638 volunteers collected over 7.7 million pounds of litter from Pennsylvania’s roads, trails and shorelines. Over 5,300 events were held, with every county participating. Groups participating in PennDOT’s Adopt-A-Highway (AAH) program, which involves volunteers cleaning roadsides year-round, are also encouraged to participate in the cleanup, with gloves, trash bags and safety vests provided. In addition, during “Pick It Up, PA Days,” set for April 13 to May 6, registered cleanup events have access to reduced or free disposal at participating landfills, through support from DEP and the Pennsylvania Waste Industries Association. Mifflinburg VFW Annual Easter Egg Hunt: Saturday, April 6, from 10 a.m. to noon at the Mifflinburg Carnival Grounds. Free event with many prizes to be given away. Click here for more information. McClure Bacon Fest: Saturday, April 20, from 9 a.m. to 3 p.m. at McClure Station Park. Visit 100 vendor spaces featuring handmade crafts and various bacon-themed treats. Click here for more information. Lewisburg Children's Museum Upcoming Programs and Events: Bubble painting (March 30); learning about bees (March 31); learning about the chick hatching process (March 29-April 6); celebrate autism awareness (April 7); study the water cycle (April 7); father-daughter dance – tickets required (April 12); reading of “The Cow that Laid an Egg” (April 13); spotlight on skunks (April 14) and learning about the importance of mindfulness (April 20). Please note: fees and registration requirements apply to some of these events. Click here for additional information. Discover Selinsgrove Half-K Fun Run: Saturday, May 4, from 1-4 p.m. on Market Street from Snyder to Bough streets. The non-athletic event features stops along the way to taste, sample and experience Selinsgrove businesses. Fee required for registration. Click here to register and for more information. MACC Free Kids Fair: Saturday, May 4, from 10 a.m. to 2 p.m. at Middle Creek Area Community Center, 67 Elm Street, Beaver Springs. Kids’ activities to include crafts, bounce houses, games and more. Enjoy free hot dogs, chips and drinks. This event is cosponsored by the Snyder County Coalition for kids. Click here for more information. 2019 MACC Anniversary Live Auction: Saturday, May 4, at Middle Creek Area Community Center, 67 Elm Street, Beaver Springs. Doors open at 5:30 p.m.; live auction begins at 7 p.m. A Chinese auction and silent auction are also available, beginning at 10 a.m. Click here for additional information.